My father went off to war and never came back to us. My mother remarried when I was 10 and my new Dad was in the Royal Navy. Until I was 13 he was mostly at sea, so lots of chores came my way. One of my most important tasks was to clean out the fireplace in the living room each morning and lay the makings of a new fire by scrunching up old newspaper and putting kindling and suitably sized lumps of coal on top of it. Things were pretty tough for most people in Britain after the war, but one of the great treats I enjoyed with my mother was having picnics in the countryside, when we’d pick any ripe blackberries we found to make jam. We used to take a wicker basket to carry a tablecloth, an old kettle, a tin teapot, mugs, spoons, a packet of tea (no tea bags! ), sugar, a small jar of milk, sandwiches, jam tarts and — if I was really lucky — maybe some biscuits. I’d find a few rocks for a fireplace on which to balance the kettle, filled with water from a stream. My kindling would be dry leaves or grass, then small twigs, and I’d find fallen branches in the woods or hedges to get the fire blazing. Looking back, things seemed much freer then and nobody complained about you making a fire. These days, even though I’ve lived in the Nagano Prefecture hills since 1980, teaching outdoor stuff to both children and young adults, I’m still shocked that most of them had never struck a match before — let alone built a fire. To me, being able to build a safe fire in wind, rain or snow is an essential part of living and showing hospitality to guests, while the flames seem to keep bears and other wildlife away, even if you’re roasting meat or fish. When I first moved here I joined the local hunting association, whose members knew the mountains, forests and streams like the backs of their hands. As we’d often be out from dawn to dusk, I saw wildlife and amazing scenery that you just couldn’t experience from a car or truck. Now, as much as possible at my age, I want to share such experiences with others — but just as there are far fewer hunters these days, with the association’s membership down to under 20 from 79 back then, most of the old trails have become disused and wiped out by landslides or flash floods, blocked by fallen trees, or simply grown over. So when we began using horses for logging on our C.W. Nicol Afan Woodland Trust land four years ago, it occurred to me that we could also train them to carry gear and supplies. Now, having recently got two horses of our own, and the logging equipment we need, we’ve now also acquired pack saddles and panniers from America. Forested mountainsides and steep valleys are not really natural habitat for horses, so both us and them have to practice together and get used to operating there. Hence in October this year, we ran trial treks with two groups of guests, one made up of young people and a more senior one whose oldest member was 78. 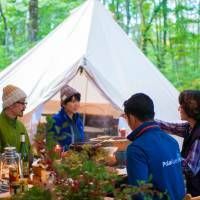 The idea was to set up a nice, comfortable camp and serve tasty meals in the woods. 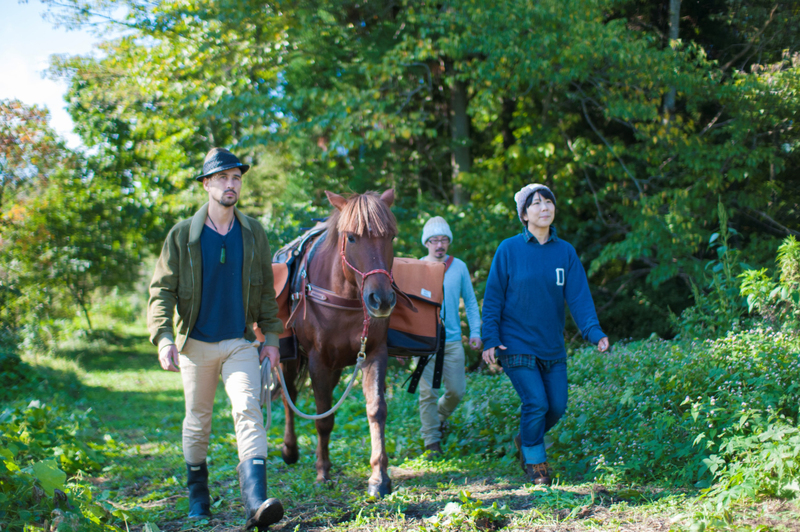 The equipment and supplies were loaded into the panniers, which were weighed and balanced and carried by the horses, and our guests then walked along with them. I was the chef, and I cooked on a campfire or a two-burner Coleman kerosene stove like those we used during the numerous Arctic expeditions I took part in. My staff set up the camps the day before, and we filmed everything so we can show authorities what we are doing, and as a reference tool for ourselves. With the horses led by our handlers, we followed trails from our new horse lodge into woodland owned by either the Afan Trust or myself — using our land so we didn’t have the hassle of getting permits to camp in places other than established sites. Besides, I didn’t want to argue with anybody about having campfires. Our guests were nice people who probably wouldn’t have complained about getting sandwiches and jam tarts, but that wasn’t what I had in mind. While they were enjoying their first welcoming drinks, I brought out a pate of river char, a beautiful trout-like mountain fish with delicate white flesh. I’d got 15 of the fish alive from our neighboring fish farm and, after killing and cleaning them, I steamed them with wine in an iron pot before removing all the bones and adding mayonnaise, dark basilica vinegar, salt, pepper, chopped parsley and a little fish stock I’d prepared. Then I mixed the lot in a blender and put the resulting pate in the fridge in easily transportable Tupperware containers. Served on crackers or fresh French bread, it was delicious and went wondrously well with chilled white wine. The next course was spaghetti with a sauce made from three kinds of woodland mushrooms and crumbled chestnuts — all from our woods — flavored with homegrown herbs and spices before being quickly cooked in butter, cream and a little red wine and topped off with grated Parmesan. And I served that pasta with red wine, of course. Then came the main course: venison stew. For this, I’d seared chunks of meat in an iron pot with vegetable oil and garlic before adding water and tossing in chopped onions, potatoes, carrots, celery, sweet bell peppers and a local delicacy that looks like a wrinkly green pepper, but is actually very hot and spicy. Again, sage and thyme from our trust’s rockery went in with the salt and pepper. After simmering all that long and slow, I served it to our eager guests with fire-toasted brown bread. For dessert I made a pile of pancakes using two long-handled German steel skillets that are perfect for camping. There were two kinds of sauces: one involving just a dash of butter, a sprinkling of dark Okinawa sugar and a generous squeeze of sudachi lime juice; the other made with chopped-up apple and banana, cooked with butter on a hot skillet, to which the dark Okinawa sugar was added then a generous dash of dark rum to make an impressive flambe that almost seared my whiskers off. For my older guests, the horses had kindly carried a bottle of Old Nic’s Dram — a single-malt whisky I made in 1986 at the Nikka distillery in Yoichi, Hokkaido, and which we bottled on my 60th birthday in July 2000. Sipping the rich, dark, smoky spirit by the campfire was an ultimate pleasure. Now, after that trial trek, the aim is to gradually increase our range until we are confident of the routes, the gear, the horses and our staff. 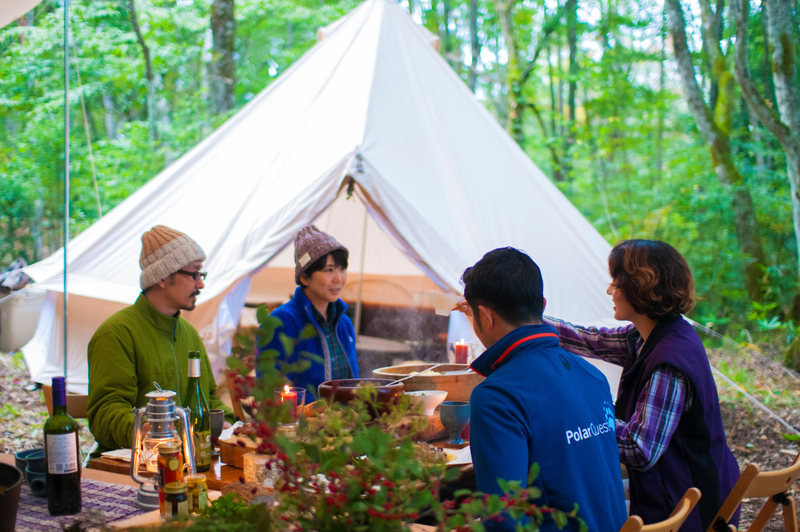 Then we hope to invite small parties of guests for a cordon bleu, off-the-beaten-trail experience unlike anything else in Japan. Happy trails to one and all (and our steeds)!